I finished Solstice Dream. 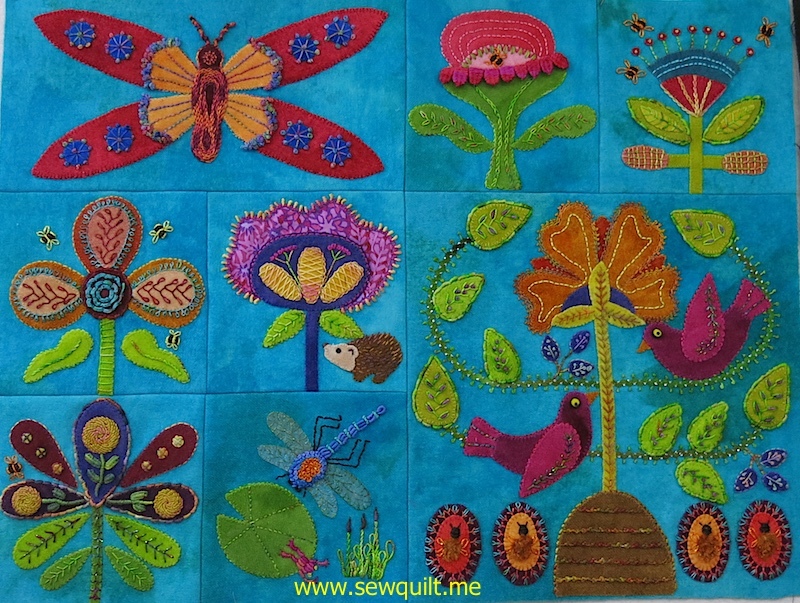 I added more leaves, berries, bees and caterpillar to the border. The top is currently 36 1/2" by 42 1/2". 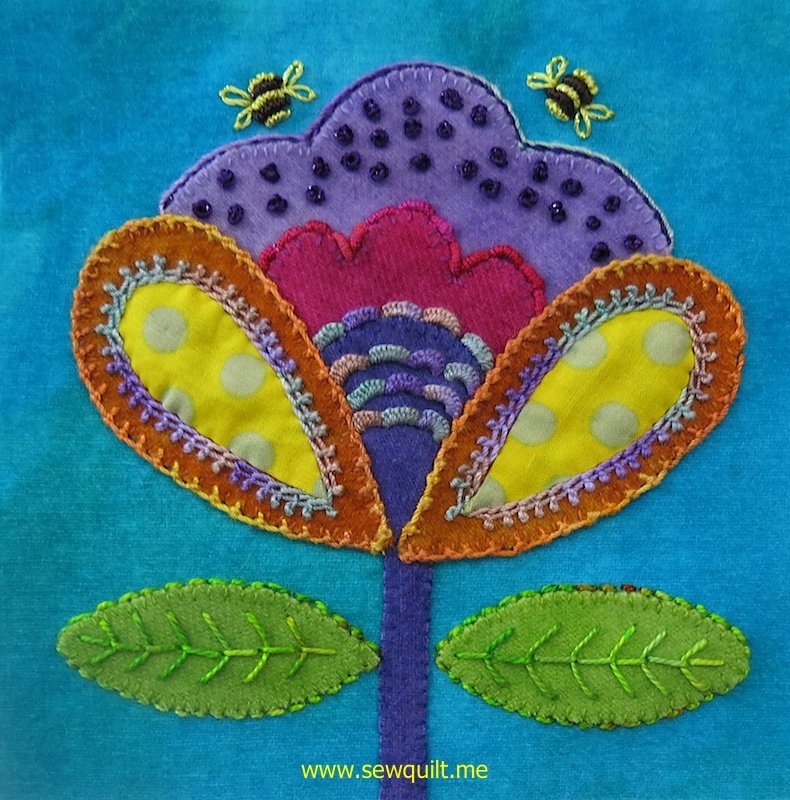 I was really happy to cross off a wool appliqué wool project off my To Do List. Solstice Dream was a fun project, I learned a few new stitches and new techniques. I am getting ready to mail the quilt top to be machine quilted. A Lillie update. Lillie is growing and learning new things each day. 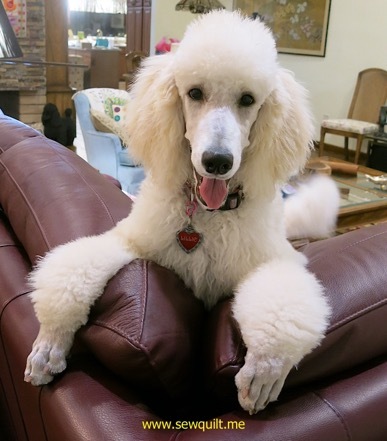 She is now 5 months old, over 30 pounds and 20" at the shoulder. A few weeks ago, I was able to get a few not blurred pictures of Lillie and Molly. These last 10 days, I have been concentrating on finishing all the blocks for Solstice Dream. Last night, I finished the Curvy Caterpillar block. 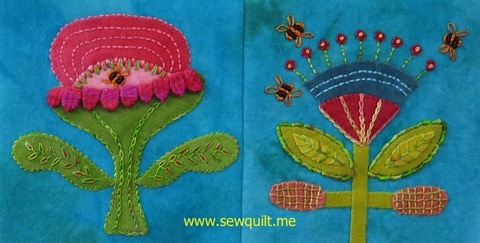 I rather enjoyed stitching the tiny caterpillar and I am thinking I may add some caterpillars and bees to the borders. This afternoon, I stitched all my Solstice Dream blocks together. The quilt is now 24 1/2" by 30 1/2". I really like all the blocks but I think my 3 favorites are Pretty in Pink, Curvy Caterpillar and the Marsh blocks. I have the top border prepped and really to appliqué and embellish. I am beginning to think I might be able to finish the quilt by November 1st. I took a week off from stitching September Fresh Cut BOM, I was able to finished blocks 9 and 10 of Solstice Dream. I always go a bit crazy stitching drizzle stitches, I love to just pack them in. I fell in love with the colors of Morning on the Seine silken pearl which was used to stitch the cast on bullions and crested chain around the cotton appliqués on the petals. 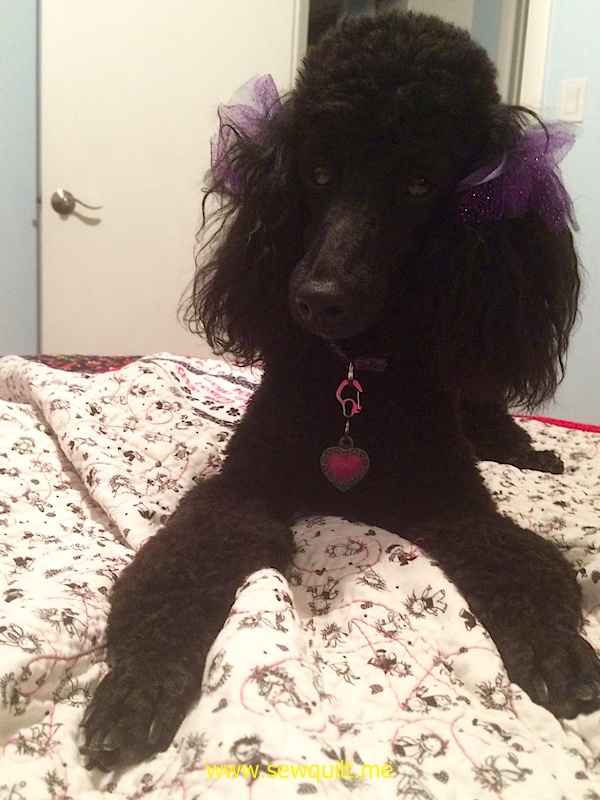 Just had to post latest picture of Lillie. She is getting bigger everyday. Lillie is 17 weeks old and now about 25 pounds. 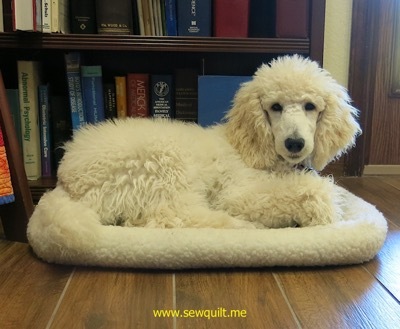 She is getting too big for a small dog bed but she did manage to curl up small enough to fit this morning. 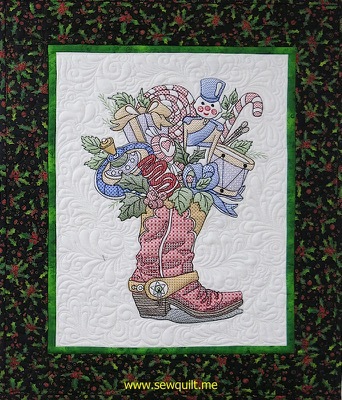 Sunflower Cowboy Boot is now quilted and bound. Beautiful machine quilting was done by Jessica Jones Gamez. Finished quilt is 20" x 25". 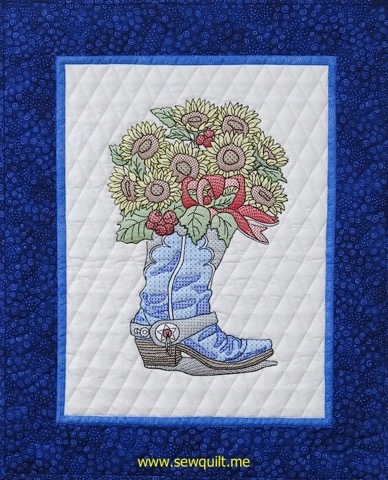 "Boot"iful Bouquets are machine embroidery designs by Claudia Dinnell. Claudia has an unique method for preparing fabric before doing the embroidery. The background fabric is stabilized with Shape Flex SF101 by Pellon, then a polymesh cutaway stabilizer is sprayed with Webbond by Mettler to adhere it to the back of the background fabric. 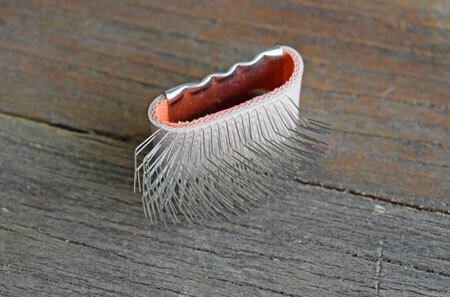 After the background fabric is hooped, a piece of tear-away stabilizer is floated under the embroidery design. Hooping is easier with the polymesh stabilizer since it is softer and more flexible than medium weight tear-away stabilizer. 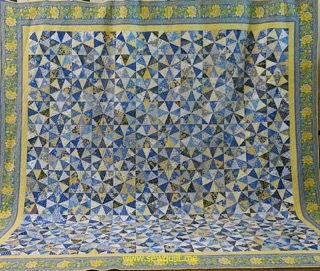 What to do with all the blue and yellow fabrics after making a traditional kaleidoscope king size quilt in 2013. 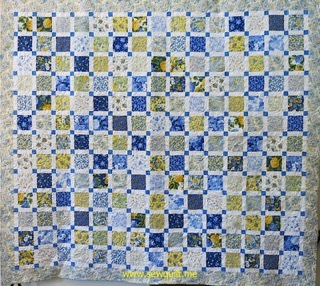 The quilt has 144 7” blocks using over 50 different blue and yellow fabrics so I really had a lot of fabric left over. Pam, my cousin who lives near Batavia New York, lives in a house built circa 1840. 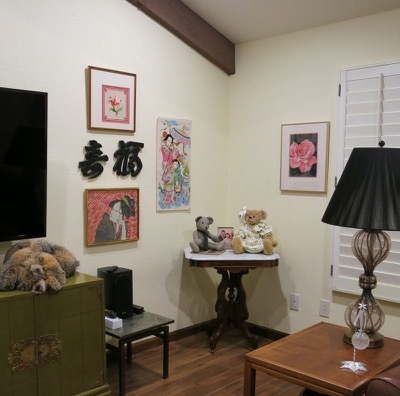 In 2015, she finally did a full remodel of the second floor so she now has beautiful new master bedroom with new closets, windows, flooring and the room is painted a lovely yellow with white baseboards. Yes, a blue and yellow quilt would be just the what this room needs. 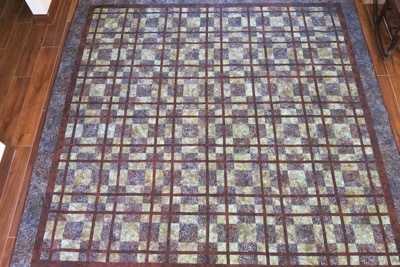 New York Garden Trellis has 195 4 1/2" blocks sashed with white on white fabric with blue cornerstones. I did have to buy more fabric for the back but the rest of the fabric did come from my stash. The finished quilt is 82" x 92" and was machine quilted by Jessica Jones Gamez. 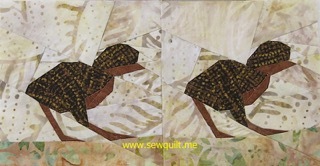 I used Quilter's Dream Wool batting which is now my favorite batting to use in bed quilt. I love that Quilter's Dream Wool batt can washed and dried in a dryer. It is summer in Phoenix, I was thinking about the cooler weather to come in December while I was binding the Christmas is for Cowboys quilt. I actually do not mind summers in Phoenix but I am thankful for air conditioning. I took a machine embroidery class with Claudia Dinnell of Claudia's Creations in January. Claudia designed a new rework style design for machine embroidery call "Boot"iful Bouquets which has 3 boot types and 3 different bouquets to choose from, "Boot"iful Bouquets is the ultimate pick and chose machine embroidery design. The boot types are a cowboy boot, an ice skate or a Victorian boot and the bouquets choices are toys, sunflower or instruments. I used my Bernina 790 and the maxi hoop to complete the embroidery. 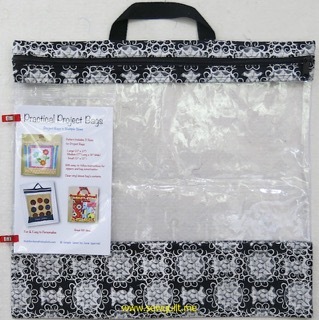 The maxi hoop has a 8 1/4" x 15 3/4" embroidery field which reduced the number of necessary re-hoopings. Claudia has an excellent method for perfect placement and alignment so everything lined up perfectly. I was able to complete the Christmas boot with only one re-hoop. 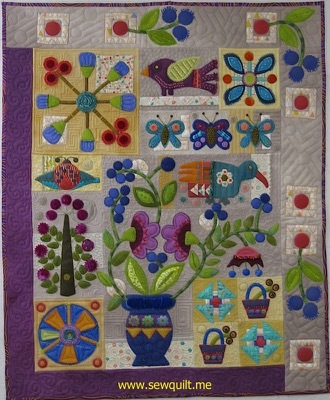 I will be donating this quilt to Quilt for a Cause, their mission : To use the art and business of quilting to pursue advances in breast and/or gynecologic cancers by raising funds for research, by continuing the education of medical professionals, and by supporting clinical organizations that raise awareness, offer detection and provide treatment for all women. 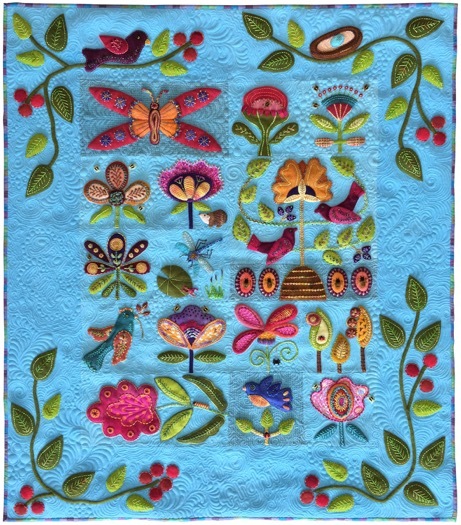 Jessica Jones Gamez did the beautiful machine quilting. The quilt is 21 1/2" x 25". Another quilt made from my stash! It is always satisfying to finish a binding a quilt. It is doubly satisfying to finish a quilt that is made completely from fabric in my stash! I found an opened Bali Pop, a collection of 40 different 2.5" x 44" strips of batik fabric from Hoffman Fabrics. 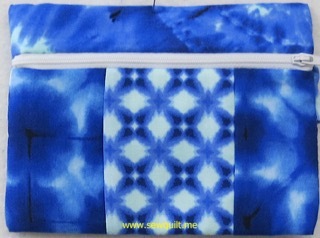 A Bali Pop is basically a batik fabric version of a jelly roll. 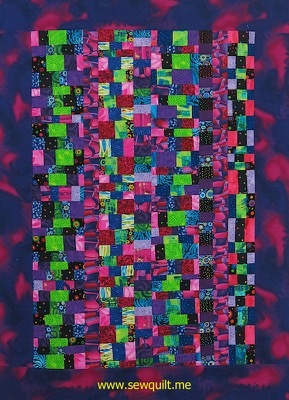 I cut a few more batik strips from fabric in my stash and made a quilt. 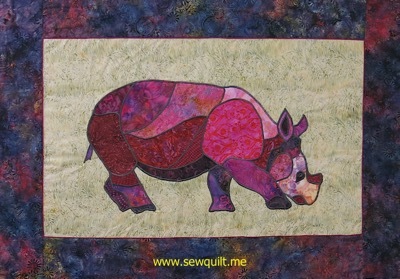 I again made the Andouille Quilt from the book Jelly Roll Jambalaya Quilts by Jean Ann Wright. 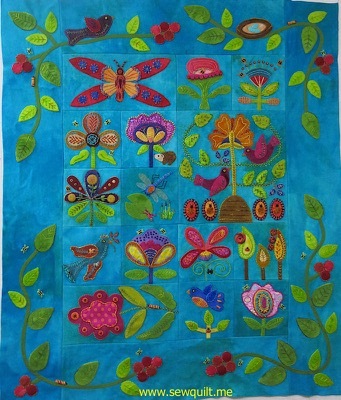 Jessica Jones Gamez did the machine quilting with a leaf design. 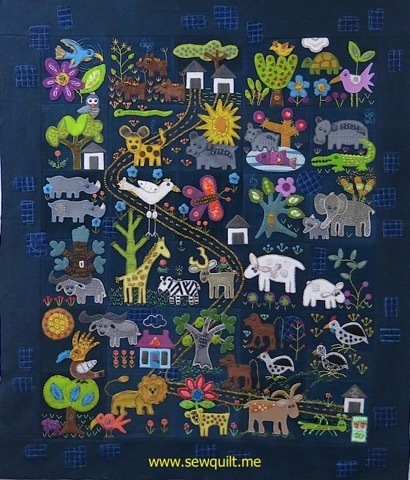 I named the quilt, Tropical Forest, because of the quilting motif and the colors of the quilt. The finished quilt is 52" x 67"
120 piano keys later, I finished the border for my newest wool appliqué quilt. 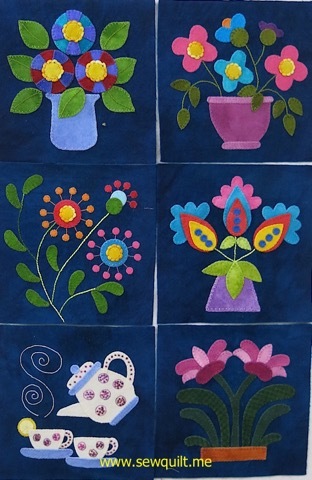 This quilt is just one block from Kim McLean's appliqué quilt called Flower Pot, the block I used is on the right side of the quilt. 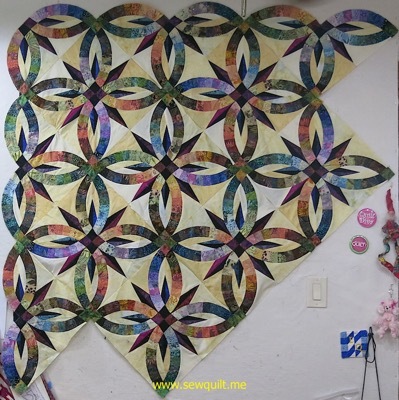 Kim's quilt is huge, 78" X 90" and the individual blocks are quilt large. I took the Kim's original pattern to a printing shop to reduce the block size to 75% of the original size. 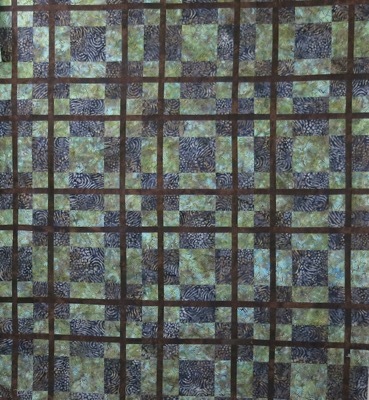 The interior block 15" X 35". My quilt is a combination of wool and cotton fabrics. 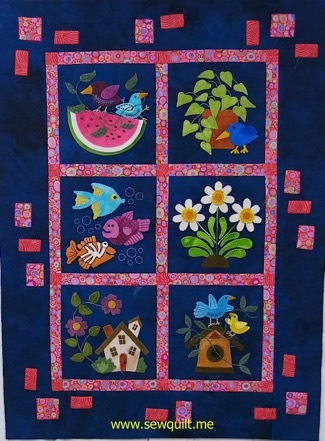 I used Cherrywood Hand Dyed fabric for the background, Kaffe Fassett fabrics for the piano key border and some of the appliqué shapes. I used a variety of embellishing threads, silken pearl, sashiko threads, razzle thread by Wonderfil and Oriental Linen thread. 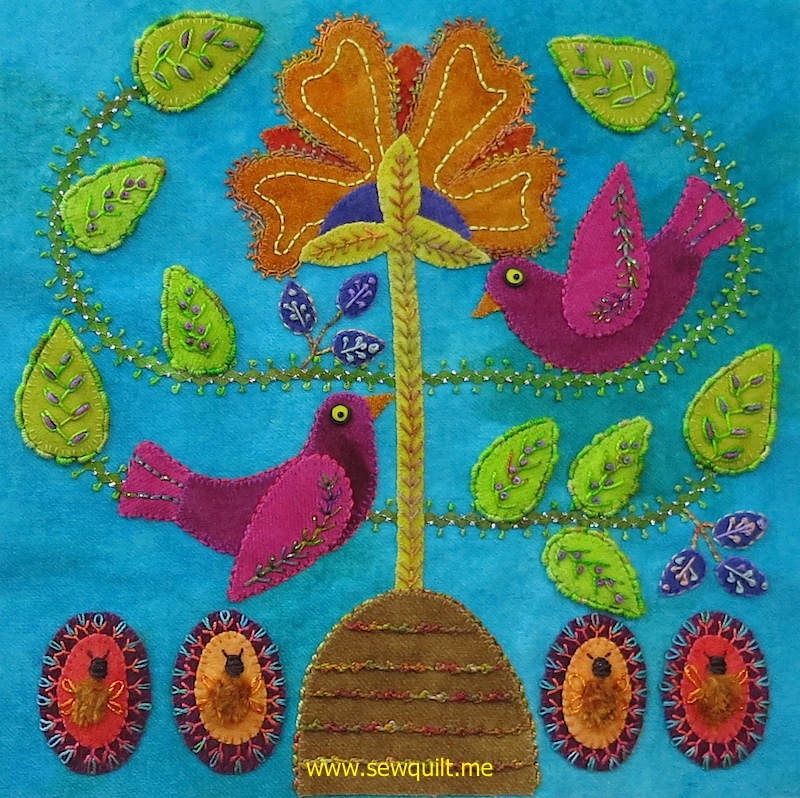 I used Painter's single loop embellishment on the lower left turquoise shape which I must admit was quilt a challenge to appliqué. The quilt is about 23" X 43". 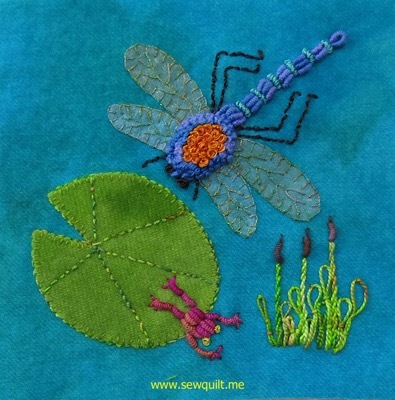 Today, Sue Spargo has started a 4 day countdown to the release of her new book, Folk-Tails. 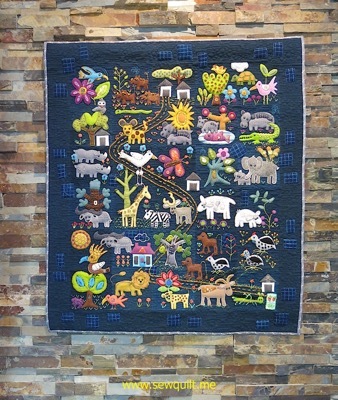 Today, we are allowed to share pictures of our completed Folk-Tails 2015 BOM quilts. This is my Folk-Tails quilt top, it measures about 37" by 43". 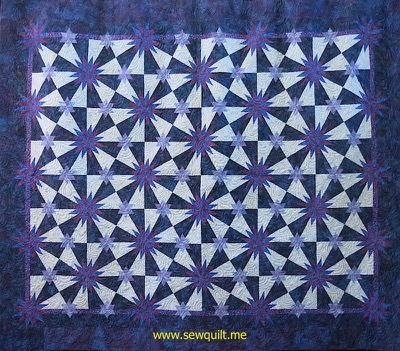 My quilt is awaiting machine quilting by Jessica Jones Gamez, I can hardly wait to get it back. 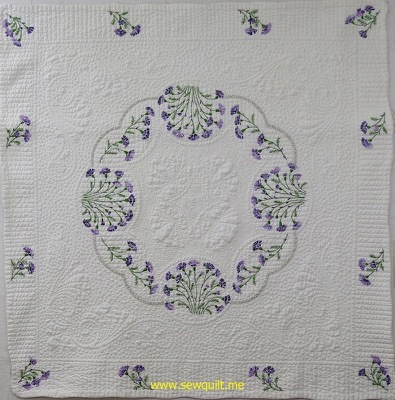 Sue picked Alexander Henry fabric for the backing which is just perfect for the quilt's theme. I know better, I should never look at Sue Spargo's web site on Friday afternoon. Every Friday afternoon, Sue sends out her newsletter and she always seems to showcase a new patterns, fabrics or threads. 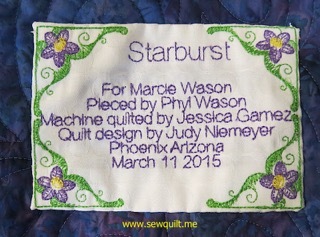 A few weeks ago, Sue published a new pattern called Tootin' Along and of course I loved the quilt as did Marcie. I immediately decided to change the generic blue cars to VW Bugs since I have long been a VW bug aficionado! 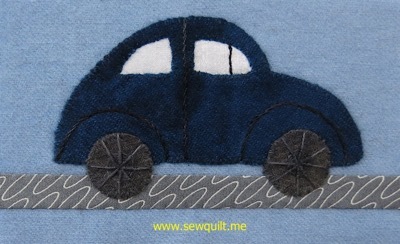 Today, I drew a VW bug and decided I really should test the design before going ahead with appliquéing the VW bugs to the quilt. This block is about 4" by 6". Today, I also prepared the background for my quilt. I decided to use a cotton fabric instead of wool for my road. 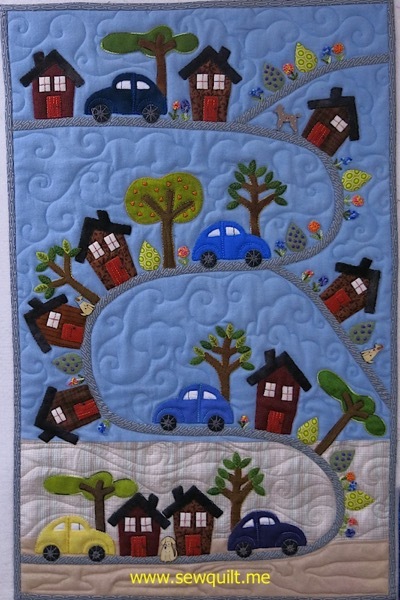 There is about 120" of road that I must appliqué before I can start preparing all the wool VW, houses and trees. The finished quilt will be about 24" by 37". Patiently waiting 10 months for a quilt to be machine quilted is hard to do but so worth the wait. 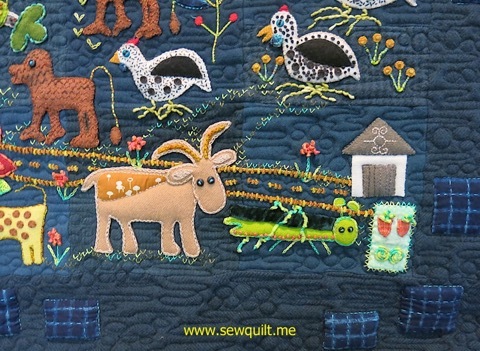 Jessica Jones Gamez did the gorgeous quilting my wool quilt. She used wool and cotton batting which gives the appliqué a trapunto effect. 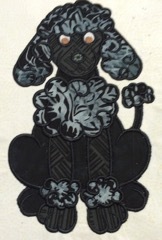 The wool appliqué were designed by Bonnie Sullivan. I added some embellishing stitches, notably the buttonhole scallops on the baby chick wings and bullion knots for the bird legs. 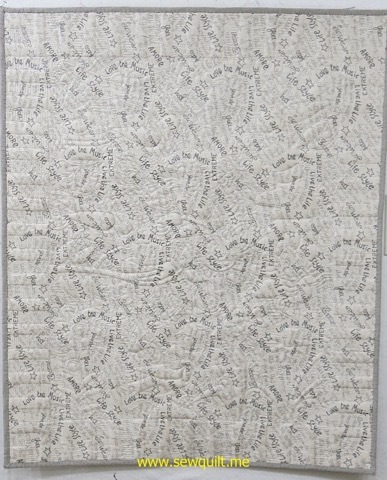 The piano key border was made with 100% Italian linen fabric I purchased at the 2014 Houston Quilt Festival. The back of the quilt is 100% linen fabric which I purchased from Sue Spargo a few years ago. 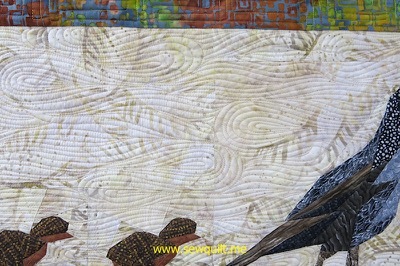 Using linen on the back, definitely made the machine quilting more challenging for Jessica. I will be giving this quilt to my daughter Marcie. The quilt is 31" by 37". I have a personal rule, I don't buy fabric without a plan to use the fabric in the immediate future. In other words, I don't want to buy fabric to add to my stash. In October, I went Modern Quilting just to check out the newest quilt store in Phoenix. 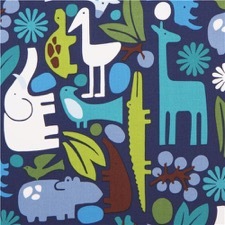 I saw a newspaper fabric that I just loved but I really did not have any plan for using this fabric. I walked around the store but I kept going back to the newspaper fabric so I looked at books for a quilt idea. 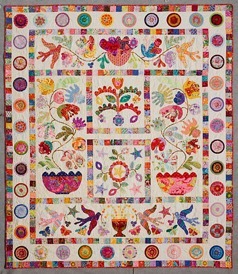 I found the book, Jelly Roll Jambalaya Quilts by Jean Ann Wright and I liked one quilt called Andouille. 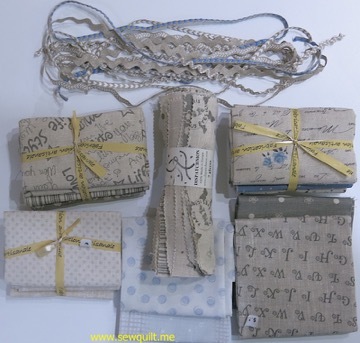 So with a quilt in mind, I purchased a jelly roll (a first for me) and enough newsprint fabric to use for the quilt back. The fabric is modern background paper by zen chic for Moda. 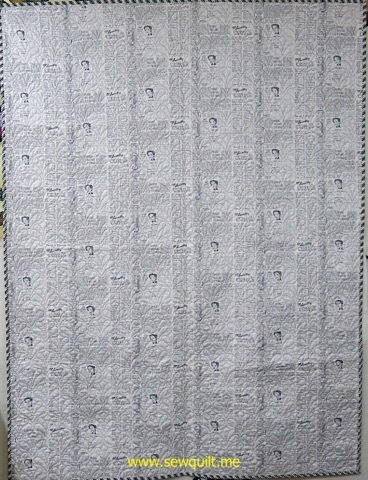 As I am sewing the quilt, I am remembering the old riddle - What is black and white and read all over? The answer is a newspaper because of the identical pronunciation of read and red. 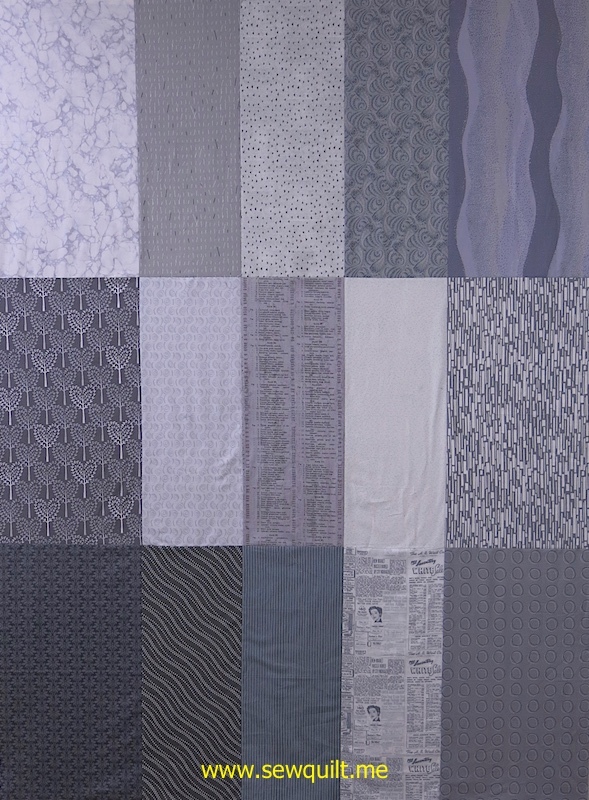 Wow, I now have a name for my new quilt, Black and White and Read All Over and an idea for the machine quilting. 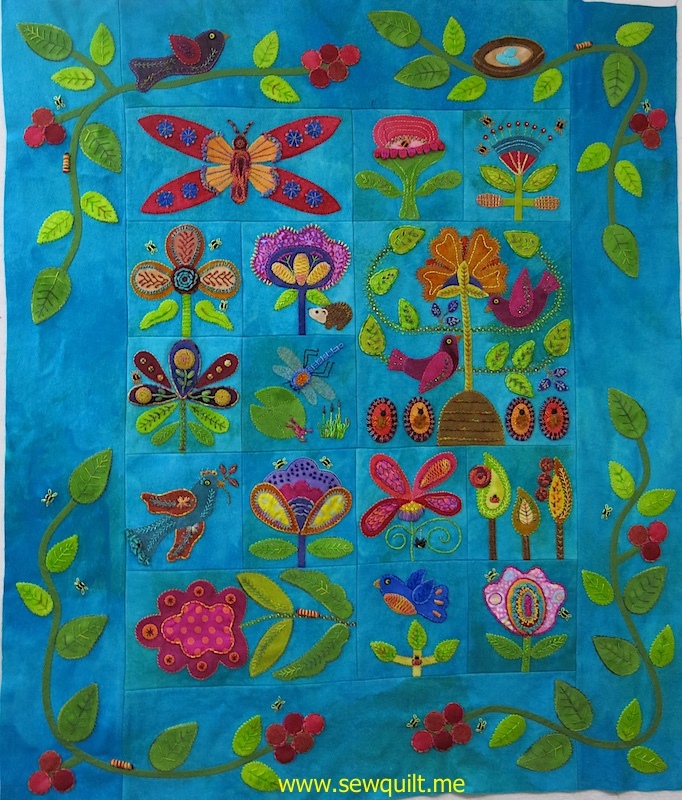 Jessica Jones Gamez did the beautiful machine quilting with red thread. I used a striped fabric for the binding which I cut on the bias. The quilt is 62" by 47". Charles Schultz's Peanuts characters, Charlie Brown, Snoopy, Lucie and Marcie, have always been a favorite of mine. I have a lot of Peanut character Christmas ornaments which always bring a smile to my face. When I saw the Peanuts Christmas fabrics in 2012, I just had to buy enough fabric to make a quilt. It took me a few years to decide on a quilt pattern. My ideas always were rather complex and so I kept putting off making the quilt. This year, I decided to just keep it simple and decided to just make shadow box frames for each block. 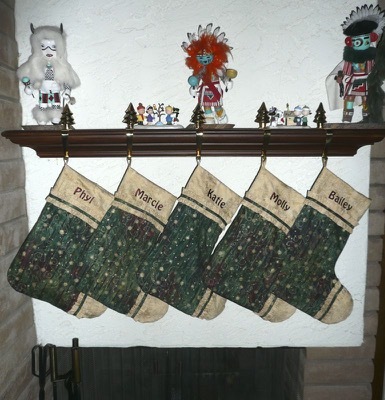 Jessica Jones Gamez did the machine quilting, she chose a perfect overall christmas light pattern. The quilt is about 47' by 47". Sunday evening, I arrived home from Houston and today I unpacked and had a chance to reflect back on my time in Houston. I flew to Houston on Wednesday, arriving in time to attend preview night. Sandy and I were sharing a room and we met up with 5 friends from Phoenix. Preview night, 5pm to 7pm is reserved for class enrollees, Sandy and I of course hit the vendor aisles first. Oh my goodness, the first few aisles were slow going because of the wonderful hand dyed wool and thread I saw. This year there were certainly many more vendors with hand dyed wools and threads to tempt me. At 9:30pm, we had only seen about 75% of the vendors but Sandy and I were exhausted and decided to head back to the hotel. 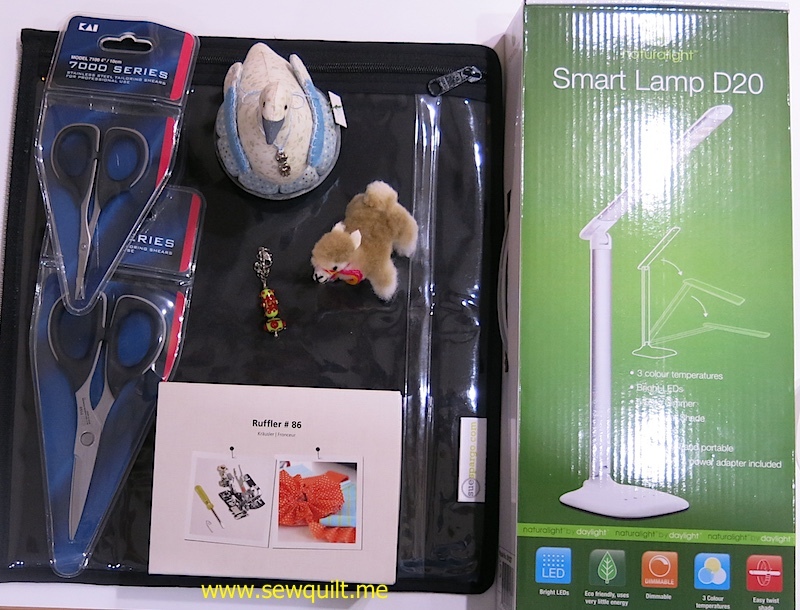 Thursday was another shopping day, it is not easy to be a quilter but somehow we preserved. Friday, we spent the entire day looking at the gorgeous quilts. Saturday, after braving a short walk in pouring rain, we finished looking at all the quilts and did a little shopping. After 3 1/2 days of quilt festival, Sunday is a short day, making sure we had not missed seeing any of the quilts or vendors. 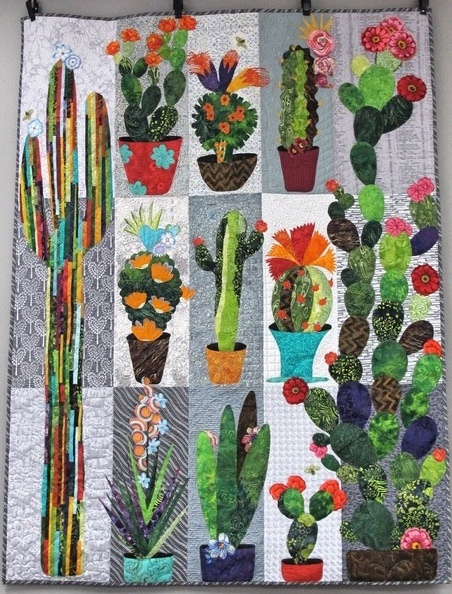 Just a few pictures of some of the wonderful things I purchased at the 2015 Houston Quilt Festival. 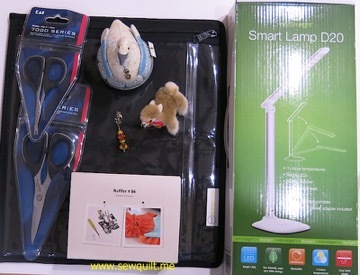 Honestly, there were very few frivolous purchases, I really did need everything I bought. 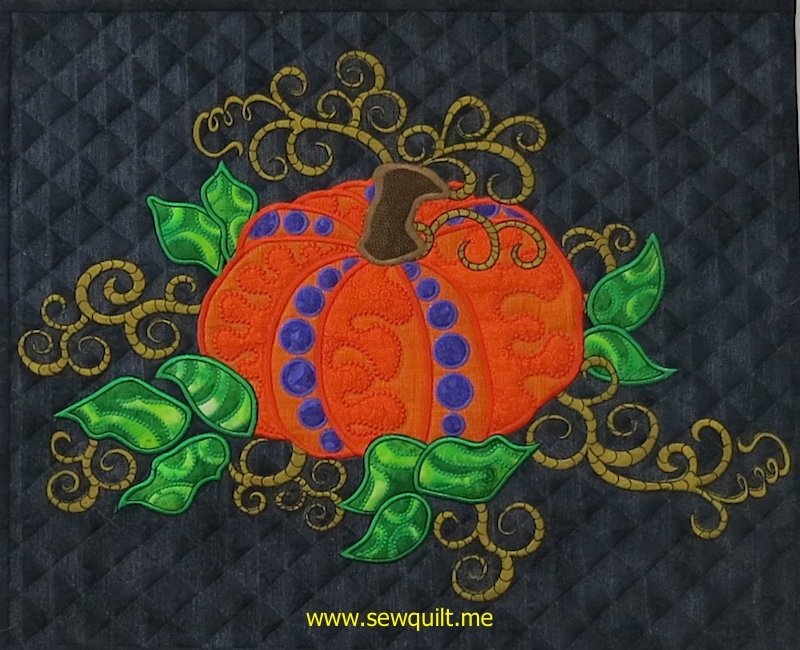 I took a class with Claudia Dinnell in August and I saw the Enchanted Pumpkin pattern. I decided that stitching the Enchanted Pumpkin would be a good way to practice the multiple hooping skills I learned in the Tis the Season class. 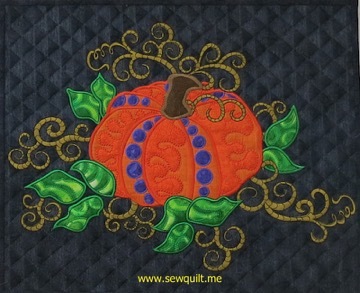 The pumpkin requires 12 separate hoopings and I chose to stitch the entire pumpkin on a solid background. 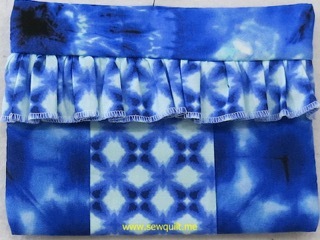 Before starting the machine embroidery., I fused Pellon SF-201 interfacing to the background and then I fused Pellon fleece This is the first time I used Pellon fleece, the biggest advantage was I did not have to use any tear away stabilizer. Another first for me, I used Havel's 5 3/4" double curved appliqué scissors. 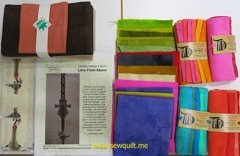 Sandy, my quilting buddy, had an extra pair of the Havel scissors and graciously gave me the scissors. Previously, I have used Gingher duck billed appliqué scissors but I found the blunt rounded tips of the Havel scissors were much easier to use. I used my Bernina Maxi hoop with the Master-Hooper which stabilizes the outer hoop allowing easier alignment of the inner hoop/hoop grid. The quilt is 18" by 22". I finished sewing the binding on Rhonda, the rhinoceros. Rhonda was designed by Barbara Jones of bjdesigns. 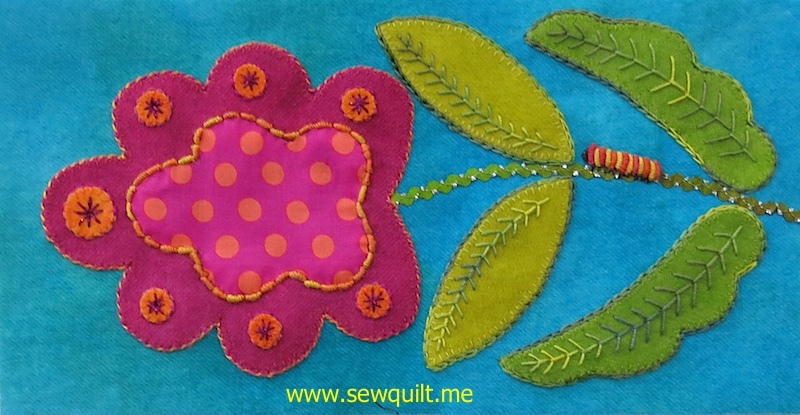 I added piping between the quilt and the border which adds just a bit of color and pizzazz. Jessica Jones Gamez did the beautiful custom machine quilting. The quilt is 27 1/2" by 39 1/2". 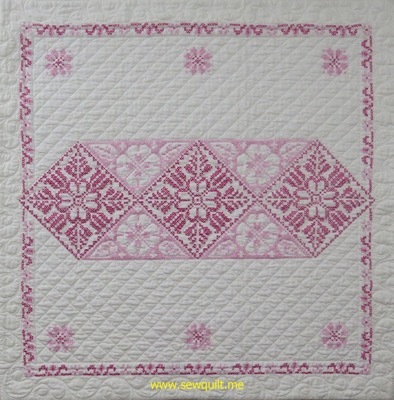 Ellie is another quilt designed by Barbara Jones of bjdesigns which I completed in 2013. 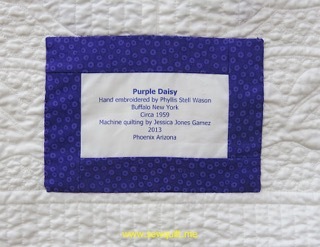 Jessica Jones Gamez also did the custom machine quilting on Ellie. 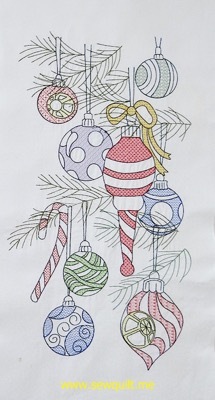 After much thought, I have decided not to do the machine embroidered borders on my Tis the Season quilt top. I really liked the Claudia Dinnell's Tis the Season quilt but I simply did not have an ideal spot to hang a 60" by 60" quilt. I really wanted to hang the quilt above my fireplace and the stone facing is only 50" wide. So I found a wonderful stripe fabric which I can use for the binding which I think will give a wonderful finish to the quilt. The quilt will be about 40" by 40". My quilt top was delivered to Andrea Woolsey who will do the custom machine quilting and I can't wait to get the quilt back. I was in my sewing room Friday, all day Saturday and Sunday and I now have all the blocks embroidered. I have most of the seminole piecing done too. I was anxious to sew 2 blocks together with the light grey sashing. Even though I was tired, I squared up two blocks and then sewed on the sashing. I am pleased with the fabric I chose for the sashing and really pleased with the overall look of the 2 blocks. This week, Sandy, my quilting buddy from Henderson Nevada, came for a short visit. Sandy and I took a 2 day machine embroidery class with Claudia Dinnell held at the Bernina Connection. 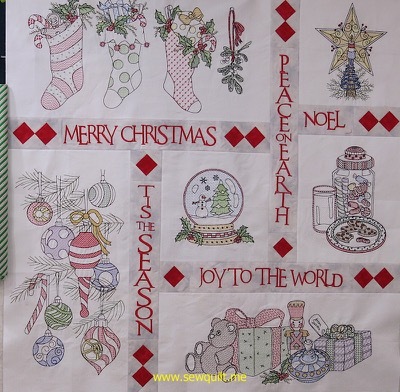 The class project was Claudia's beautiful Christmas redwork style quilt called Tis the Season. I am not very experienced with machine embroidery and I was excited to learn Claudia's perfect placement multi-hooping technique. Tuesday, I stitched the Teddy Bear block which is 25 1/2" by 13 1/2" and required 3 hoopings with the Bernina Maxi hoop to complete the design. Wednesday, I stitched the Ornament block which is 15 1/2" by 24 1/2" and required 5 hoopings with the Bernina Maxi hoop to complete the design. What a great feeling to have all the stitched designs align perfectly which is a testament to Claudia's excellent perfect placement instructions. I have 4 more blocks to embroider plus 5 word sashing blocks to embroider. I am planning to embroider at least one large block today so I can reinforce the multi-hooping techniques that I learned in class. I would definitely recommend taking a class with Claudia Dinnell. 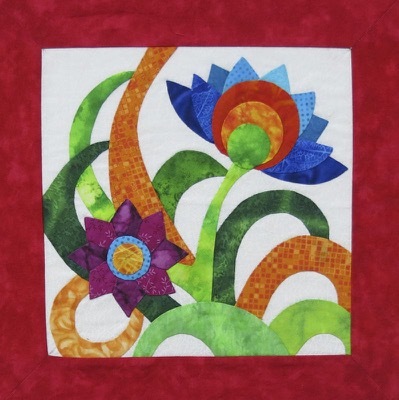 I finished stitching In Full Bloom December 30, 2014 and I have patiently been waiting for the custom machine quilting to be completed by Jessica Jones Gamez. Turn around time for custom quilting is 6 months and sometimes it is hard to wait patiently. 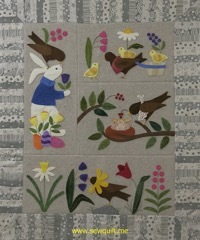 In Full Bloom was recently published by Sue Spargo, so I am now able to post a picture of my finished quilt. 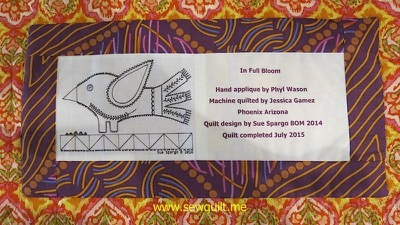 In Full Bloom was Sue Spargo's tenth BOM and this was my second Sue Spargo BOM. Quilt is 36" x 43 1/2". 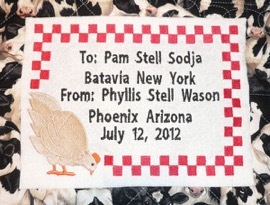 February 2011, I traveled to Tucson to take a 3 day Bali Wedding Star class with Judy Niemeyer. 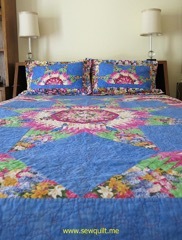 The plan was to make a king size 116" by 116" quilt which required about 27 yards of Bali batiks for the top. I got a good start sewing the arcs and melons during the 3 day class. After returning home, I continued to sew arcs and melons but a remodeling of my sewing room forced me to pack up the Bali wedding star quilt. As happens so often when a projected gets packed away, it is hard to get started again which is what happened. Last week, I was looking for a new quilting project and I unpacked the Bali wedding star quilt. Again, as so often happens, I could not remember my organizational construction logic. What to do? Luckily, I found a Judy Niemeyer Club with certified instructor Kelly Grant which meets the first Tuesday of each month at Arizona Quilts. Today, I attended the Judy Niemeyer Club and Kelly helped me to get sewn arcs and melon reorganized. I think I need 348 arcs and I have 124 arcs sewn so I still have a lot of arcs yet to sew. I did have a few blocks sewn together and some of the blocks I pinned together. This afternoon, I put the completed blocks on my design wall so I could take a picture. The Girls is now quilted, bound and hanging on a wall, it always feels like quite an accomplishment to have another quilt totally finished. 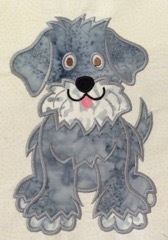 I selected the poodle, schnauzer and the golden retriever in honor of the breeds of dogs I have owned from Mixed Mutts, a machine embroidery pattern designed by Angie Stevenson. 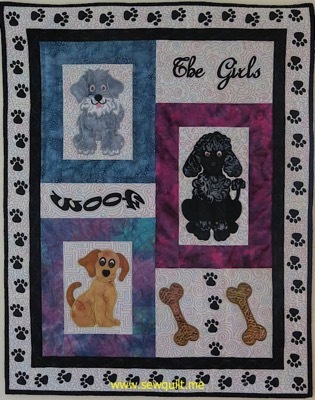 I refer to Katie and Molly as The Girls, so I decided to title my quilt, The Girls. 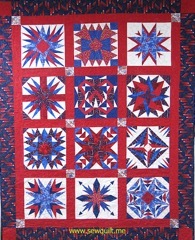 Machine quilting was done by Jessica Jones Gamez. The quilt is 25 1/2" by 32 1/2". You can see pictures of Katie and Molly my standard poodles plus pictures of my dearly departed dogs at Waiting at the Bridge. 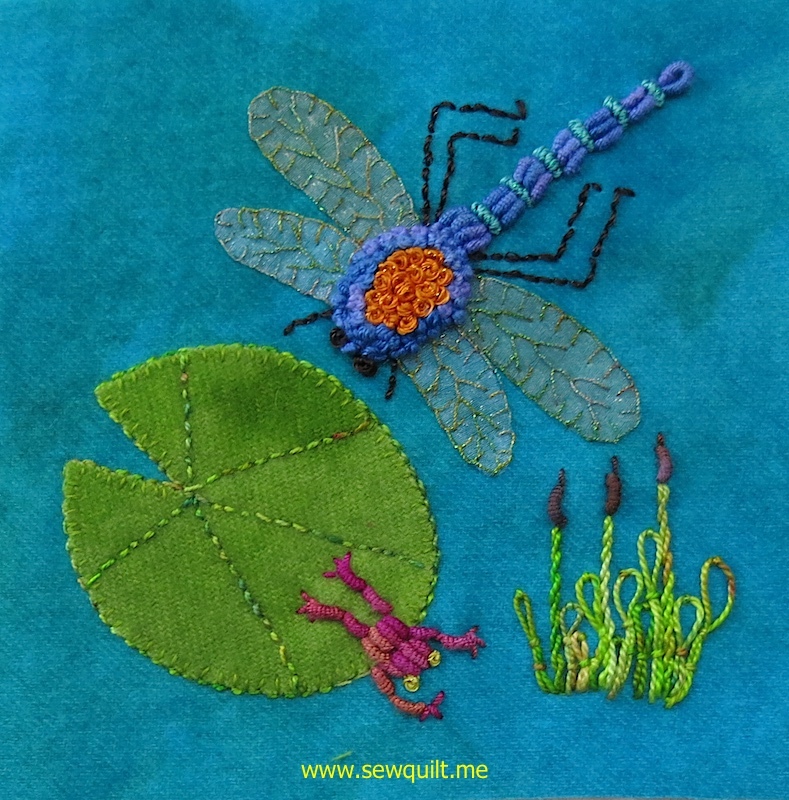 I took a break from working on Folk-Tails, Sue Spargo's 2015 BOM, to stitch Bertie's Spring by Bonnie Sullivan. 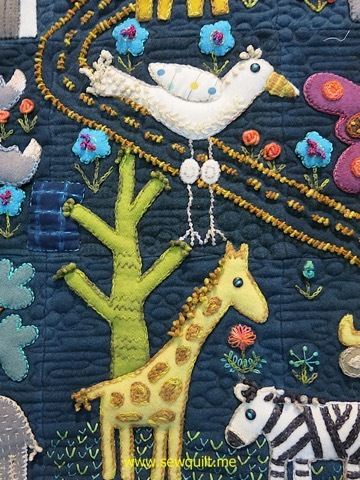 I added some embellishing stitches, notably the buttonhole scallops on the baby chick wings and bullion knots for the bird legs. I decided to eliminated the half square triangle sashing and border on Bonnie's pattern and I was really undecided on borders for the wool appliqué. I thought about designing a wool appliqué border but then I saw some linen fabric I purchased at the 2014 Houston Quilt Festival in my sewing room. There were 7 15" by 15" of beautiful 100% Italian linen. After some careful calculations, I determined I would have enough linen fabric to make a piano key linen border. Linen is more loosely woven than regular quilting cotton and tends to shift and fray easily so I starched each piece of linen with Mary Ellen's Best Press which made cutting the 1 1/2" strips much easier. After machine quilting, I will be giving the quilt to my daughter. The quilt is about 32" by 38". 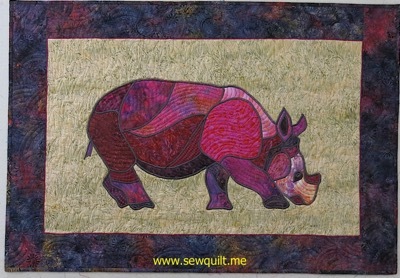 Rhonda, the rhinoceros, is now awaiting machine quilting with Jessica Jones Gamez. Rhonda was designed by Barbara Jones of bjdesigns. 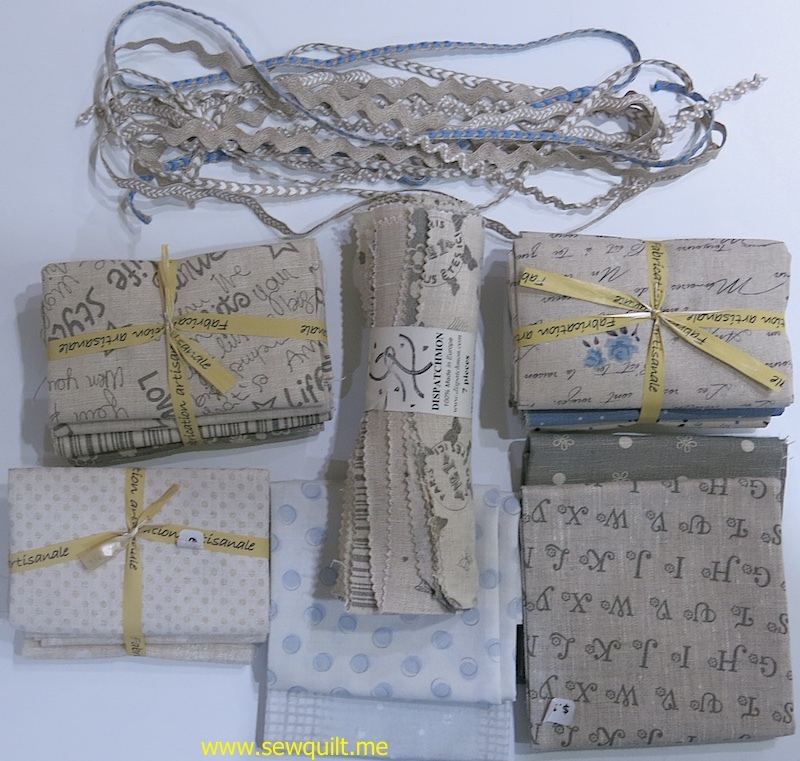 I almost had all the necessary fabrics and supplies in my stash, I only had to buy the background fabric. After machine quilted, Rhonda will hang over my daughter's bed. The top is approximately 29" by 42". 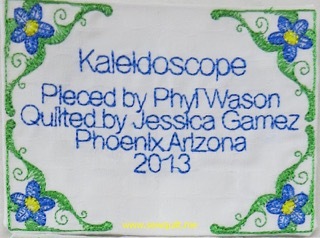 Arizona Centennial Kaleidoscope quilt is finished including the label and hanging sleeve. The kaleidoscope blocks were constructed using the Stack-n-Whack 45 degree Triangle tool designed by Bethany Reynolds and the Arizona Centennial fabric designed by Jason Yenter of In the Beginning fabric. The quilt is 29" by 41". 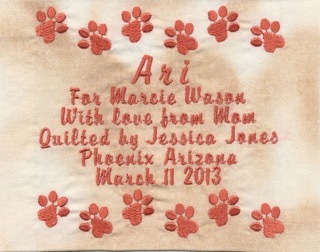 I inserted mini piping using a companion Arizona Centennial fabric which I also used for the back of the quilt. I will be donating this quilt to Quilt for a Cause which auctions and sells handmade quilts and quilt patterns to support breast and gynecological cancer research. Since 2003, Quilt For a Cause has raised over $750,000 and donated 99% of the proceeds to Tucson area organizations in support of research, training and assistance for uninsured and underinsured women. 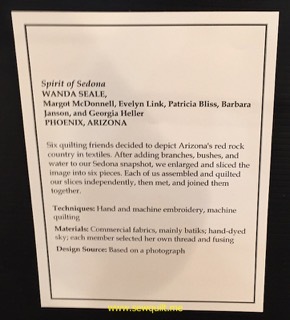 In January 2015, I attended Quilting at the Lake, a quilting retreat held in Lake Havasu City, Arizona. 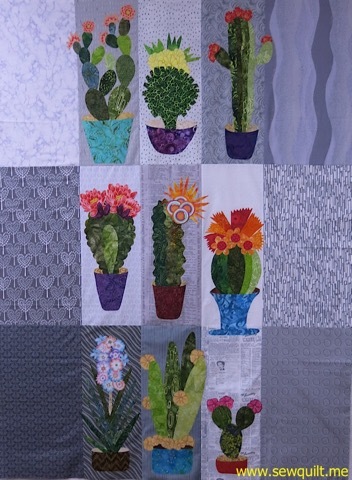 Linda Hibbert of Silver Linings Originals, designed Strolling at Lake Havasu specifically for this class. 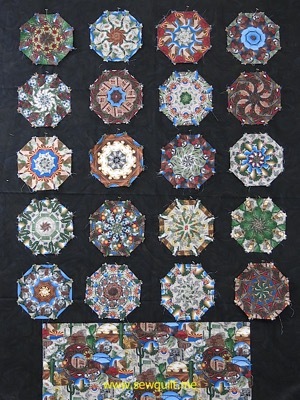 Even though I have done a lot of paper piecing, Linda's paper piecing patterns are quite challenging. I enjoyed learning some of Linda's techniques for paper piecing. Jessica Jones Gamez did the gorgeous machine quilting. The top is about 16" by 36". Finally finished and delivered. I belong to Carol Doak's on-line Yahoo group, Carol generously designs blocks specifically for the on-line group. 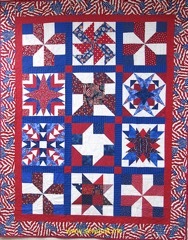 In 2007, I started making the free block designs in patriotic fabrics so I could donate a quilt to Quilts of Valor. I made 16 12" blocks, enough for one quilt but not 2. I received 8 more blocks and I was able to make 2 quilts. 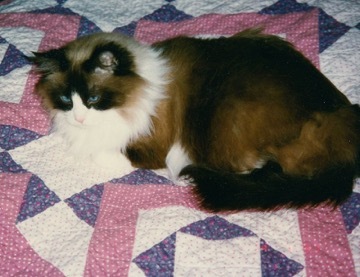 After the quilts were machine quilted, my sister, Lucie, had a relapse of cancer and after her death, the quilts got put into a drawer and forgotten. 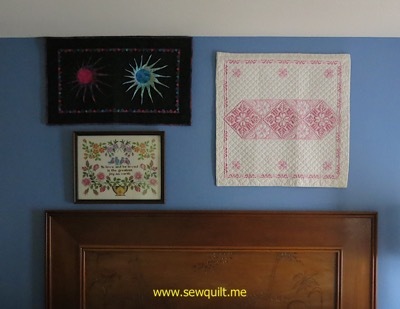 A few weeks ago, I discovered the quilts and took the time to bind both quilts. The quilts are 56" by 68". The Bernina Connection, my local quilt store, sponsors sewing days to support the Quilts of Valor project. Today I delivered the 2 quilts to the Bernina Connection so they can finally be sent to the Quilts of Valor Project. 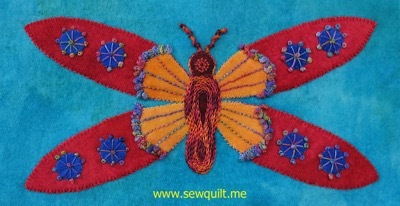 I just returned from a 3 day Magic Carpet class held at Quilting in the Desert. 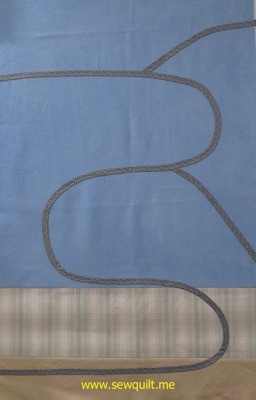 Ginny Goodbar taught liberated quilting techniques to construct strata which were then combined to create a "magic carpet". The finished top is then layered with batting and backing. The top will be quilted with couched threads, beads and decorative stitching. My magic carpet top is now ready to quilt, but I have a few other projects to complete before I can start embellishing my top. The top is 30 inches by 42 inches. 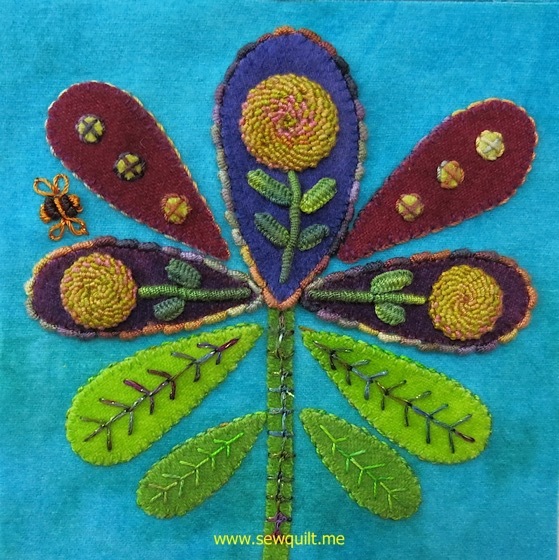 Back home after a great few days with quilting friends. 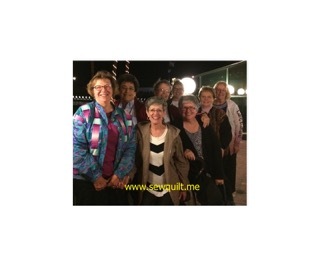 We attended Quilting at the Lake in Lake Havasu City Arizona. I drove up on Friday with with a quilting buddy Perri. We then had a great lunch with Sandy and Joann who had just driven in from Henderson Nevada. After a wonderful lunch and visit to 2 great quilt stores we were back to the hotel to rest up for our quilting class on Saturday. 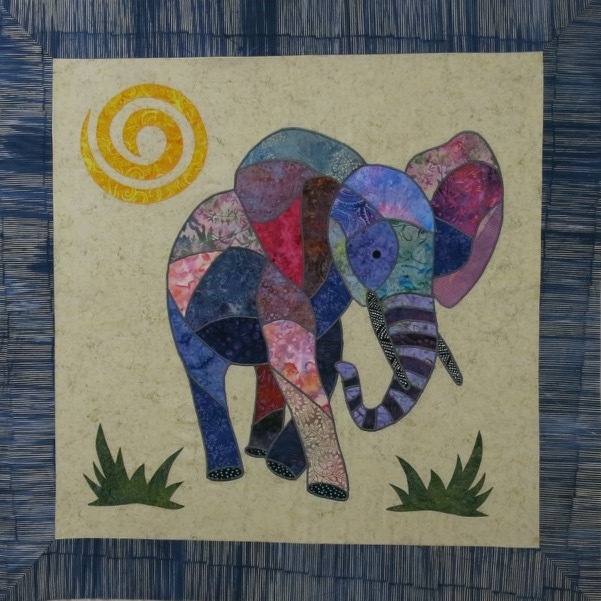 We had a little bit of rain on Saturday morning but that did not dampen the fun we had in class with Linda Hibbert, Silver Linings Originals, who designed an intricate paper pieced quilt for the class. 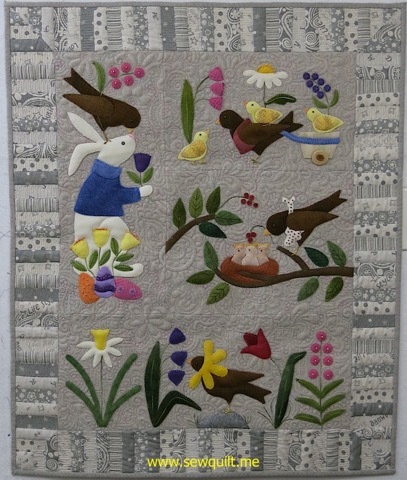 Linda titled the quilt "Strolling at the Lake Havasu" which featured Gambel quail. It was a great class, learned some great paper piecing techniques. I was able to finish 2 of the chicks on Saturday. Can't wait to to finish the third chick plus the other Gambel quail. After dinner, we decided to take a group picture with the London Bridge as a background. 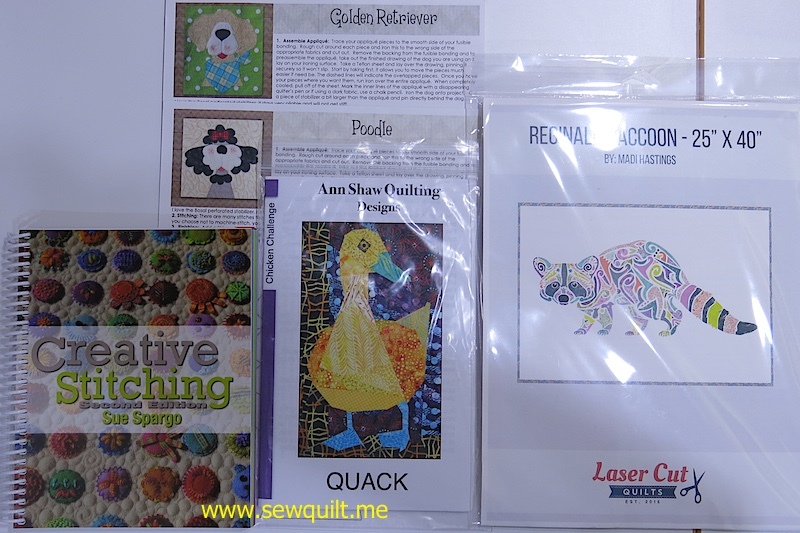 Friday and Saturday, Sandy, my quilting buddy from Henderson Nevada, attended Destination Creativity. The 2 day event, hosted by the Bernina Connection, included four 3 hour classes. 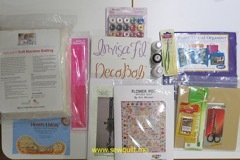 All the class kits and supplies were provided as well as the Bernina machine. Friday morning I made a small bag using the Bernina 1150 MDA overlocker. The bag was constructed entirely with the overlocker. Friday afternoon I learned curved piecing while piecing blocks for a table runner. Saturday morning, I made a large project bag. 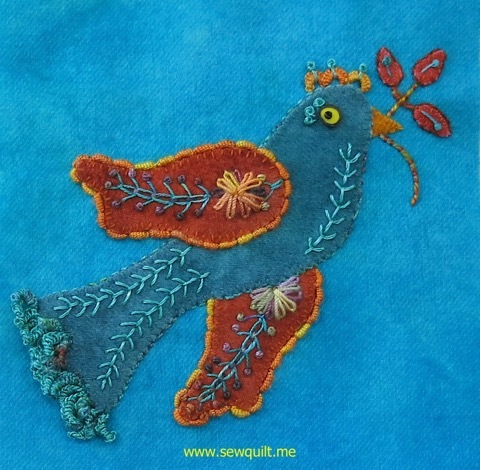 The last class was machine embroidery taught by Claudia Dinnell. Claudia was a fabulous teacher and I really learned some great new machine embroidery techniques. The class project was a double eyeglass case which is almost finished, I just have to sew on the binding. 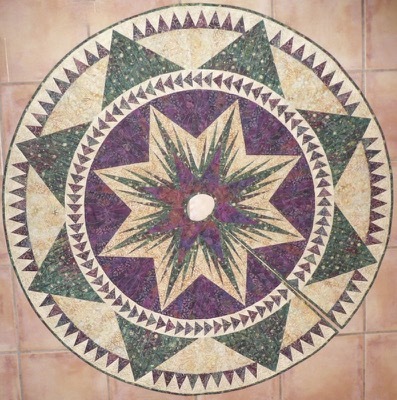 Saturday, I want to a kaleidoscope clinic at Quitz, a local quilt store. In 2007, I had took a class with Bethany Reynolds, but I need a refresher on the stack and whack technique. 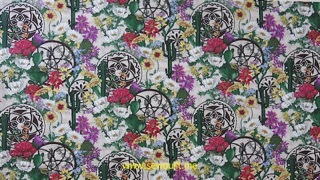 I purchased the Arizona centennial fabric in 2011 with the intention of making kaleidoscope blocks from the fabric. Saturday, using the Stack-n-Whack 45 degree Triangle tool, I cut out wedges from the Arizona centennial fabric. Today, I began sewing the wedges into kaleidoscope blocks. I was able to sew 20 of the 24 blocks I wanted for the quilt. I pinned the blocks on some black fabric that I think I will be using for the sashing and borders for the quilt. This is a picture of the completed blocks a small piece of the centennial fabric. 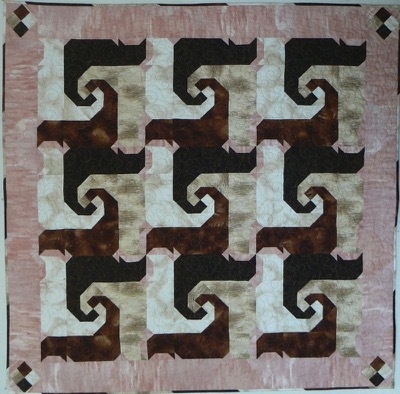 This quilt was inspired by Right Slice quilt published in Quiltmaker Magazine, November/December 2013. 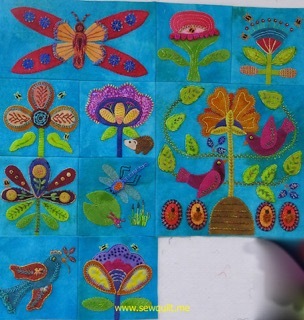 I used 3 batik fabrics, 2 batiks for the nine patch blocks and the remaining batik was inserted into the slashed nice patch blocks. 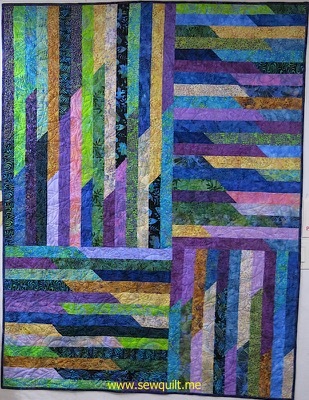 Machine quilted by Jessica Jones Gamez. Finished quilt is 96" by 96". The label was designed using Floriani Total Control U software, the machine embroidery was done on my Bernina 780. I finally finished the pillow shams for Lucie's Pineapple Star Quilt, only took me 8 years since I finished the quilt. I put the quilt on the guest room bed but covering the pillows made the overhang too short on the end of the bed. Something jogged in my memory, I think something was made for pillow shams. 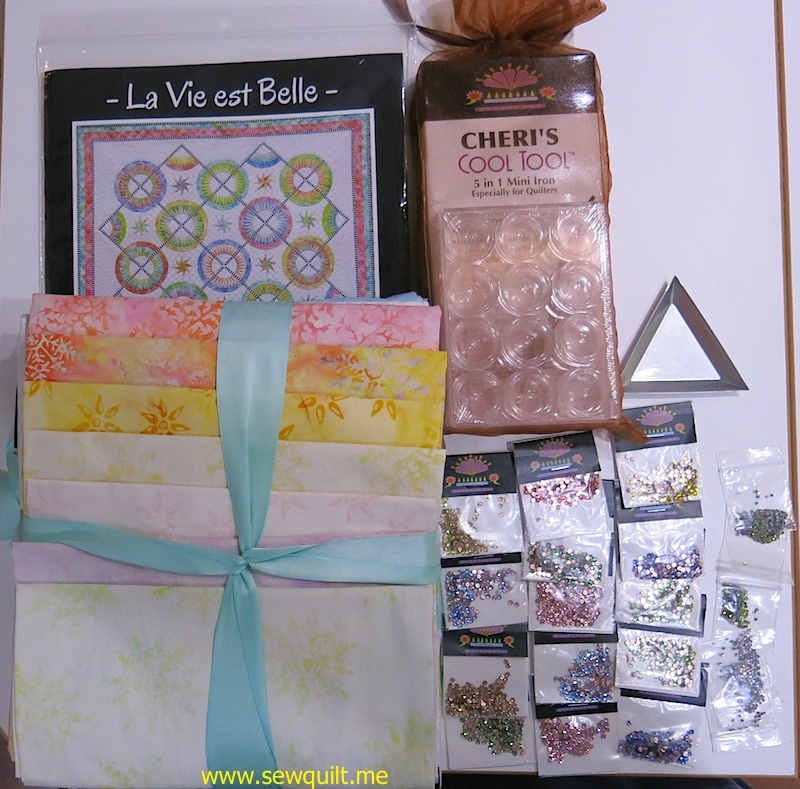 Amazing, I was able to find the quilts and extra fabric in a drawer in my sewing room. Constructing the pillow shams was really quite easy, not sure why it took me 8 years to get them done. I also realized that I never made a quilt label, drat, another thing to put on my To Do list. I also spent the morning working on my web site. August 2013, I completely redid my web site using RapidWeaver software. 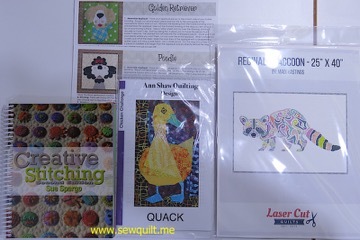 My house remodel and knee replacement sort of hindered my actually finishing the transfer of all the quilts to my new web site. This morning I just stopped all the procrastination and did it. I love a challenge. Last week I decided to make a queen size quilt for a friend. I needed a fast and easy quilt and I picked The Right Slice quilt published in Quiltmaker Magazine, November/December 2013. 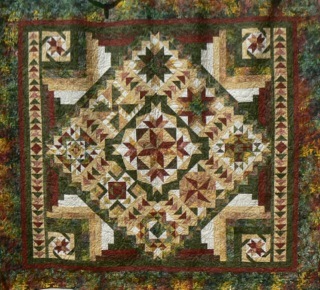 The quilt in the magazine was constructed using assorted red and green 5 inch squares. 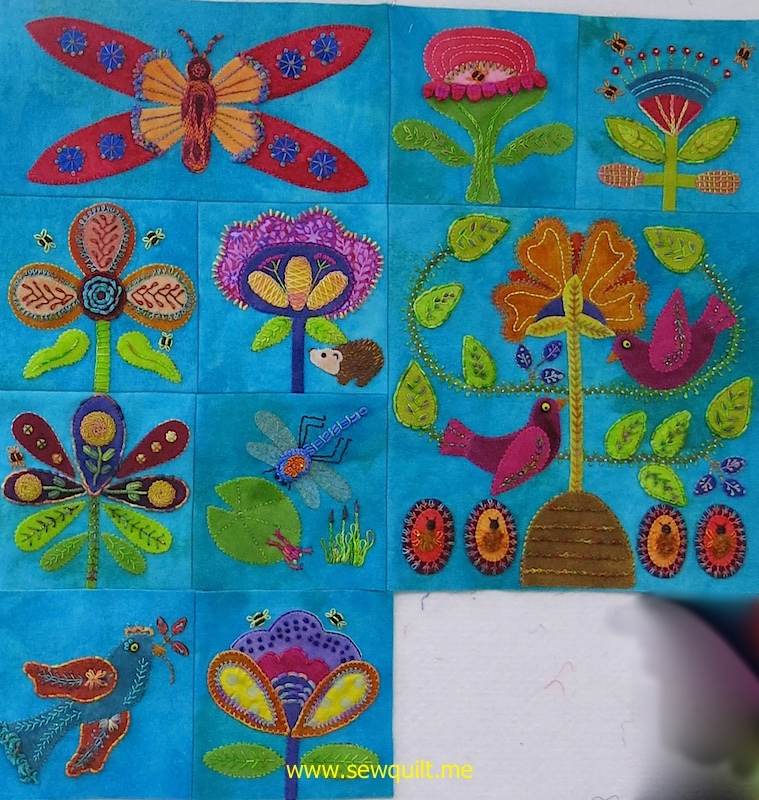 I decided to make my quilt using just 3 batik fabrics, 2 batiks for the nine patch blocks and the remaining batik was inserted into the slashed nice patch blocks. The queen size quilt requires 36 blocks. I want to finished the quilt top by Tuesday so I can take the top to be quilted by Jessica Jones Gamez. It is going to be close, but I think I will finish the quilt top by Tuesday afternoon. I now have 24 blocks finished and sewn together, plus I have the remaining 12 blocks started. 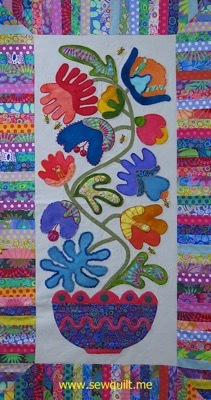 I took a picture of part of the quilt hanging on my design wall. 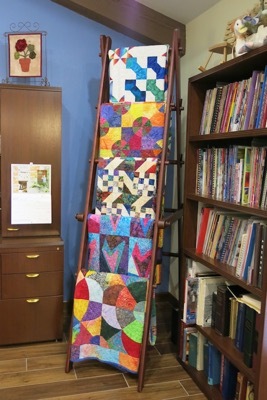 Finally, my quilt ladder is set up in my office area, it only took 6 months! 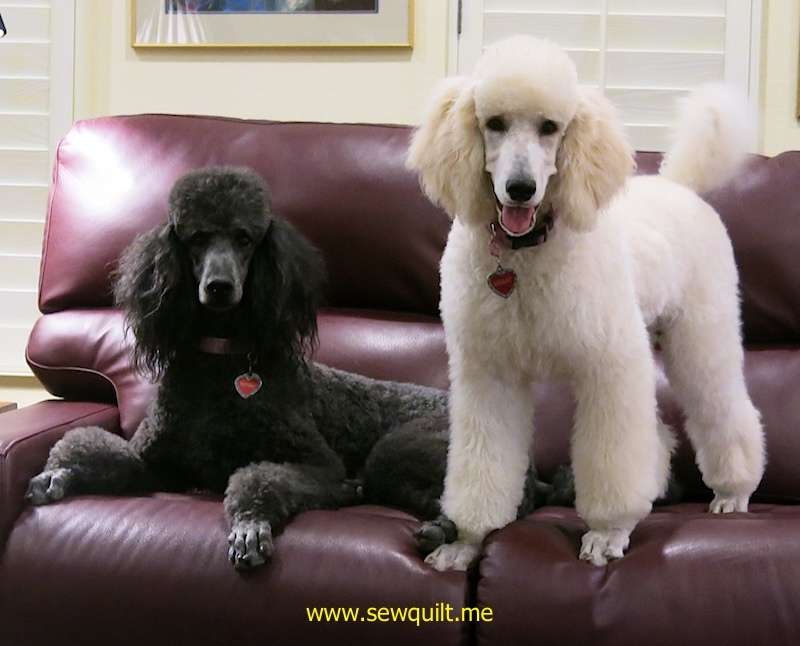 I ordered my quilt ladder from DWR Custom Woodworking when I was at the Houston Quilt Show in November 2013. At that time, I was not in a hurry to receive the ladder. The extremely cold winter weather in Pennsylvania delay the shipping of my ladder but it finally was delivered the end of March. So why is it May and I am just getting my ladder set up? Long story short, the ladder is much easier to put together if 2 people are doing it. Last week, my electrician came to install receptacle strips to my desk and I persuaded him to put the quilt ladder together. 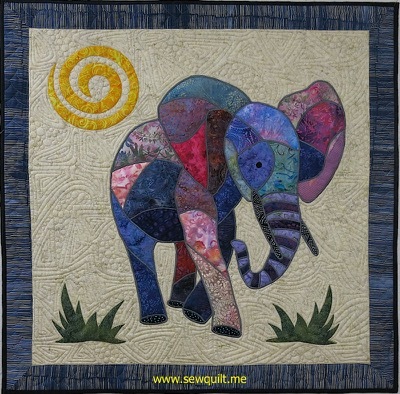 I loved the whimsical patchwork elephant. I decided to make Ellie and challenged myself to only use batik fabrics from my stash and I was able to complete Ellie in just 2 days. 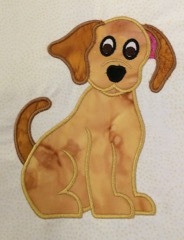 Ellie is constructed using raw edged appliqué, I used a dense satin stitch to appliqué each piece to the background. 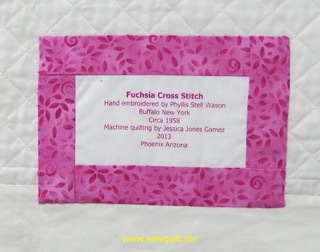 Ellie was given to Jessica Jones Gamez on Tuesday April 1 to be machine quilted. 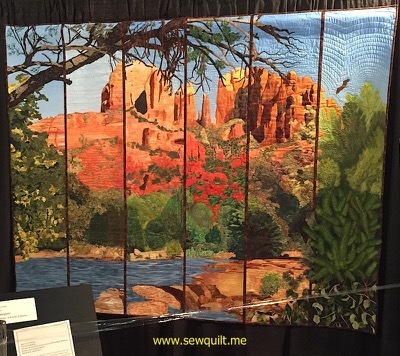 AQS, American Quilter's Society, held their first show in Phoenix this year and my quilting buddy from Henderson Nevada traveled to Phoenix to attend the AQS show February. 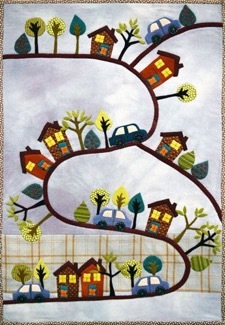 We alway have a great time when we attend quilt shows and take classes. 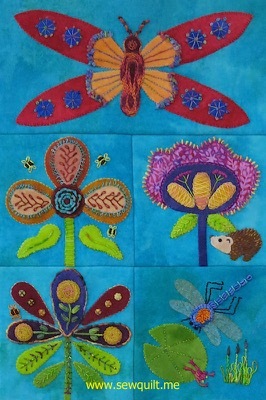 I signed up for an appliqué class with Karen Kay Buckley, the class project was one block from Karen's award winning quilt, Fiesta Mexico. I finished the center of block and have started on the borders. This a picture of Karen's finished class project. As you can see, I have a lot of work to finish my class project. 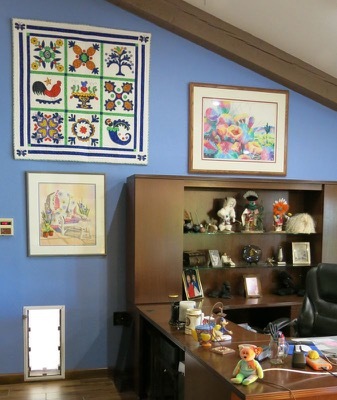 Starting with blank walls has given me a great opportunity to arrange new groupings of my quilts and pictures. I moved my desk into the great room, in an area formerly know as the family room. Today, I hung the Funky Baltimore Album quilt plus two of my watercolors. The cactus watercolor use to hang on the living room side of my fireplace. This is a corner in my living room. Lucie and John bear are sitting on the Victorian marble top table. Fang, a bear made from Lucie's wolf parka, is on the audio/video component cabinet. The Japanese needlepoints were done my mother. The wall with the rose watercolor will also have a grouping of some painted china, which I hope will be hung soon. My blue and yellow hunter's star is hanging above the atrium window, it has always hung there. Lucie did the seagull stain glass. 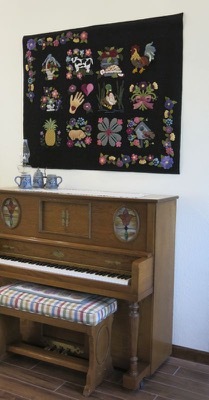 I hung my wool appliqué quilt above the player piano. I have slowly been going through boxes of stuff in my garage and I found a quilt top sewn by Lucie circa 1988. 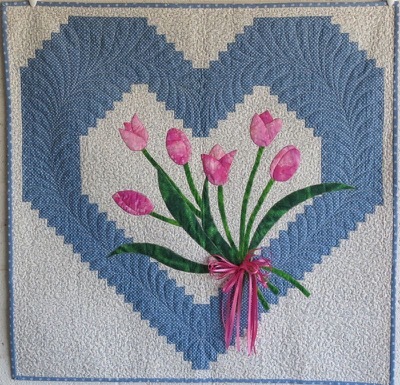 Lucie had pieced the entire log cabin heart but the tulip appliqué was not done. 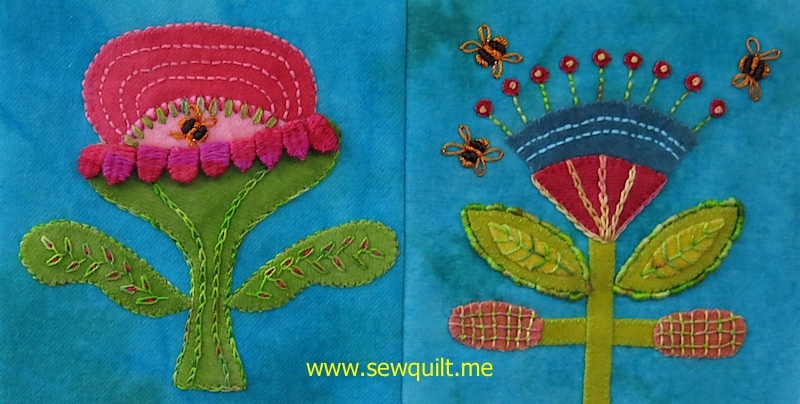 I machine appliquéd the tulips using fabric from my stash. The logs are 3/4" wide. I just need to make a label. The quilt is from the book Holiday Happenings by Christal Carter. 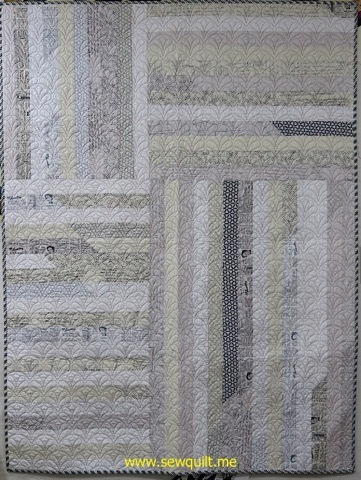 Machine quilted by Jessica Gamez. I have spent the last week, embroidering quilt labels on my Bernina 780, I always seem to procrastinate about making labels for my quilts, so I really had a lot of labels to make. So far I have finished 9 labels. Now I just have to sew all the labels on the quilts. 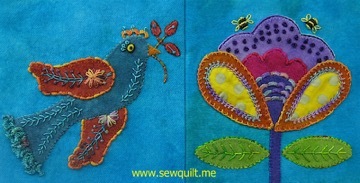 I used the Floriani Total Control Professional embroidery software. I am new to machine embroidery and embroidery software, so making these labels was a great learning experience for me. I made this queen size quilt for my cousin Deb who lives in Pavilion New York. 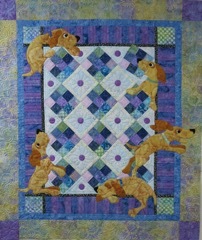 I the quilt was machine quilted by Jessica Jones Gamez. 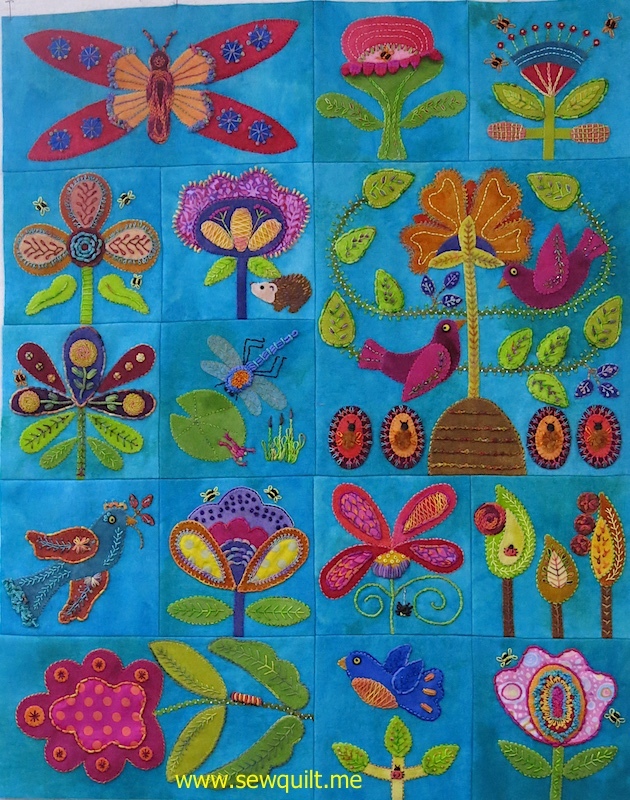 Quilt designed by Jenny Foltz for Wing and Prayer. The quilt label was stitched on my Bernina 780. It was great to see my 2 cousins, Deb and Pam and visit all the places that I remembered from my childhood. My last trip to Buffalo New York was in 1995. Pam and I went on all day Frank Lloyd Wright tour. The tour began at historic Forest Lawn Cemetery and then we traveled by trolley to the Martin House Complex, built 1903-05. We then toured the Fontana Boathouse, built in 2007, on the Black Rock Canal. After lunch at the Buffalo Yacht Club we traveled to the Graycliff Estate built 1926-31. Graycliff is located in Derby NY. The Blue Sky Mausoleum, built in 2004, in Forest Lawn was our last stop. On Saturday, Deb, Butch, Pam and I went on a Buffalo Harbor cruise. 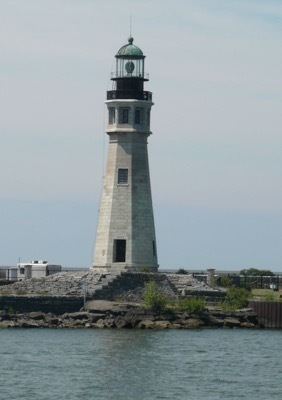 Buffalo Light House taken while on the harbor cruise. Seeing the lighthouse brought back many happy memories of my Dad. The wall hanging was made for my Dad's 88th birthday in May, 1998. I drew the nautical flags in Quilt Pro and paper pieced them. They are 3 inches finished. 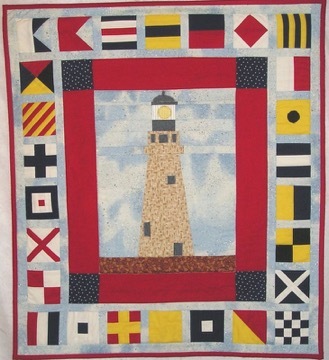 The lighthouse was also paper pieced with a pattern from Seagull Quilts. This wall hanging has special meaning as my Dad had made a set of nautical flags out of wood. The flags were hung at our summer home on Lake Erie and later in the rec room in our home in Eggertsville, N.Y. The quilt is 28” by 32”. 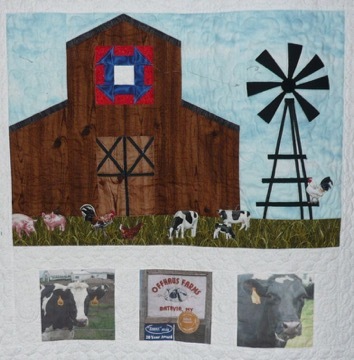 I presented the Offhaus Barn quilt to my cousin Pam tonight. 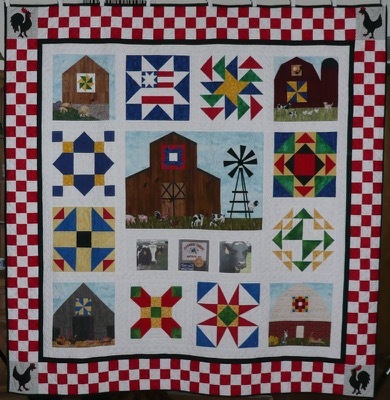 I used the book, Quilt Blocks on American Barns by Eleanor Burns to complete this quilt. 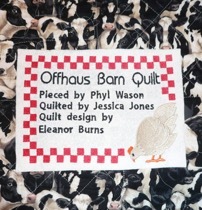 I printed some of Pam's pictures of Offhaus Farm on fabric and added them to the center barn block. The machine quilting was done by Jessica Jones. 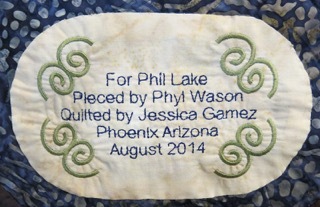 January, 2012, I attended Quilting at the Lake in Lake Havasu Arizona. I took a class, Piping Hot Curves-Macaroni, with Susan Cleveland. I had a great time learning curved piping. 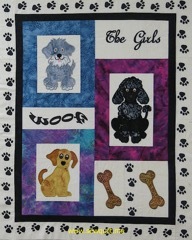 I had quite a few black and white dog prints and I decided to make a quilt which I could use on the back seat of my car. 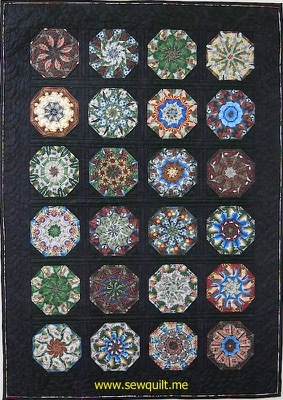 Machine quilting was done by Jessica Jones Gamez. The finished size of the quilt is 52" by 16 1/2". 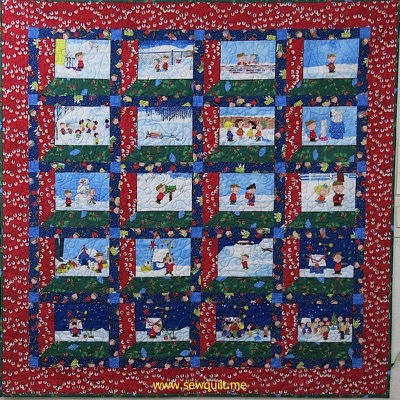 Christmas Tree Skirt designed by Judy Niemeyer. Machine quilting by Jessica Jones Gamez. Finished size is 60” diameter. New Christmas stocking to match my new Christmas tree skirt. My sister had a Bernina 180 with the embroidery module, I machine embroidered the names instead of doing hand embroidery as I have in past years. I also learned how to use the ruffler attachment for my Bernina.